No other printers will be able to compare! They are simply the best price versus performance printers available! 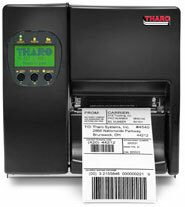 The THARO H-400/H-600 Series printers have an elegant design, are extremely compact and are robust enough for commercial use. They feature a durable, all metal construction with a cast Aluminum center wall and a large media window for easy viewing and monitoring of supplies. The H-400/H-600 Series printers are extremely versatile. No PC is necessary. Download your label formats to the Printer’s Flash Memory (or a CompactFlash Card), unplug the printer from the PC, plug in a standard PC keyboard, and take the printer to another location. The H-400/H-600 Series printers feature a 450m (1476’) ribbon capacity and a full 203mm (8”) O.D. label roll capacity making them suitable for large volume printing requirements. Print from Windows, UNIX, Linux or Mac! CUPS (Common UNIX Printing System) Drivers and Windows Drivers are included on the Printer’s Accessory CD. Start printing labels right out of the box with the included FREE labeling software package EASYLABEL® Start. The H-400/H-600 feature a 3 month or 25,000 linear meter warranty on their printheads. Ribbon Length: 450 m (1471') Type: Ink inside or ink outside thermal transfer ribbons (wax, resin and wax/resin) in widths of 30 to 110 mm (1.18" to 4.33"). Core inner diameter 25.4 mm (1"). Maximum ribbon roll diameter 76 mm (2.99"). Length: 450 m (1471') Type: Ink inside or ink outside thermal transfer ribbons (wax, resin and wax/resin) in widths of 60 to 174 mm (2.36" to 6.85"). Core inner diameter 25.4 mm (1"). Maximum ribbon roll diameter 76 mm (2.99"). Specifications are subject to change without notice. All brand or product names are trademarks or registered trademarks of their respective companies.